These videos are all ideal for group preparatory meetings. They are short, to the point, and made to a professional standard and give an excellent overview of a pilgrimage. You can watch the videos below now, but depending on your computer and broadband the quality may be poor. Give us a call and we will send you a complimentary hard copy in a proper presentation cover which will play in both a DVD player and personal computer. 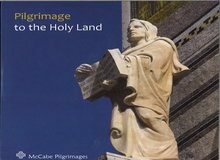 This introductory video is 7 minutes long and the Revd Philip Deller presents a typical McCabe Holy Land pilgrimage itinerary travelling through the country from Jerusalem to Tiberias. 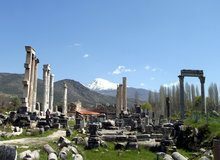 This video is 18 minutes long and was produced with the help of Revd Dr Peter Walker and introduces our recommended itinerary combining Istanbul with the Seven Churches of Revelation. 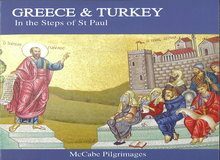 This video is 14 minutes long and was produced with the help of Revd Dr Peter Walker and depicts our recommended Pauline journey through Greece travelling from Philippi to Athens. 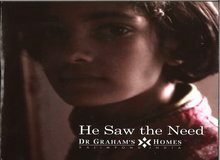 An inspiring 11 minute presentation of the work of Dr Grahams Homes in India which looks after underprivileged children from Calcutta, and is supported by the McCabe Educational Trust.